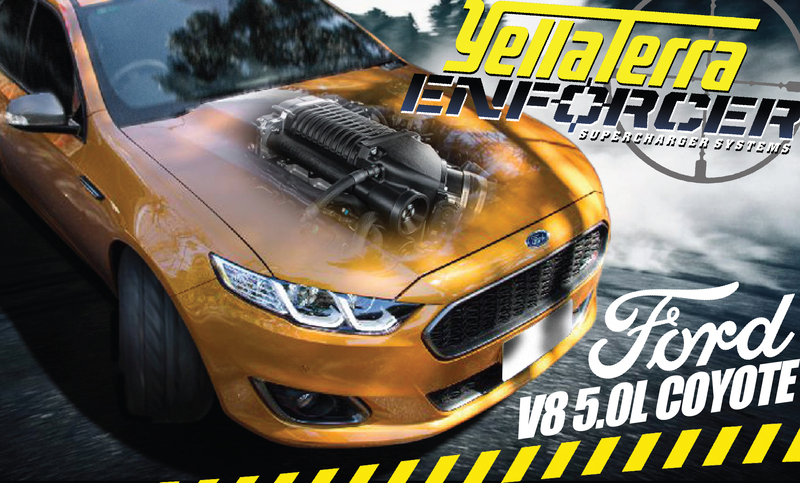 Yella Terra’s new 2900 Enforcer Upgrade is the only choice if your wanting to go to the next level with your 5.0L Coyote/Miami powered vehicles. Utilising Whipple's ground breaking new 2.9L front entry supercharger, YellaTerra have designed a package to bolt straight onto your 5.0L engine utilizing all the factory hard ware and existing 8 rib drive system, making it look right at home on your FGX. Besides having the ultimate power out put, this upgrade allows you to set aside and retain your factory supercharger set up so your vehicle can be returned to the original set up at any time. The small capacity Sprint Eaton 1.9L roots based system can only handle mild engine mods and limited boost increases before it becomes inefficient and not capable of making any more power. In most cases pushing the small Eaton 1.9L factory blower to try and match the HP levels of the 2.9L Whipple, will cause premature wear or blower rotor lock ups, causing unrepairable damage to your supercharger assembly and in a lot of cases the engine! The intercooler used in the Whipple manifold is over twice the size of the factory intercooler core. No more dangerous, engine destroying, intake temps or need to purchase expensive, inconsistent, inter chiller systems. Whipple's unmatched 2.9L capacity, twin-screw efficiency, and massive integrated intercooler, combines to make the FGX Enforcer Kit is the most powerful supercharger upgrade available in Australia.